To launch UniversalEye tap MENU to get a list with all apps, scroll to UniversalEye and tap the UniversalEye entry. Whenever you launch UniversalEye, the license is checked first. If the license is not valid you are informed and you have the chance to open the UniversalEye's detail page on the Android market to buy the license. During license check all buttons are disabled. Afterwards you can tap the button you want. While no text for the tool SCROLLING TEXT is entered, the button SCROLLING TEXT is disabled. First enter a text or choose one from the archive. The current text is shown below the SCROLLING TEXT button. General rule: the left button starts the tool, the right button (if existent) calls the settings dialog for the tool. All settings windows have at the bottom 3 buttons: SAVE, RESET and CANCEL. The rule is: all changes in the window become active only if the dialog is left with SAVE. Leaving with CANCEL or by pressing the BACK button of the smartphone discards all changes. RESET resets all buttons and controls to their defaults or to the status when the dialog was started. Tapping the SCROLLING TEXT button starts scrolling text. First, 2 flashes are created, then the scrolling text scrolls over the display in letters as huge as possible for the display, finally again 2 flashes are created. This sequence is repeated until the BACK key of the smartphone is pressed. After that you return to the main menu. While the text scrolls the display brightness is maximized and the display timeout is set to "off". Leaving Scrolling text resets brightness and timeout to their previous values. Enter the text to be scrolled in the "Scolling text" area. By tapping SAVE below this area, the entered text is saved additionally in the archive. When texts are available in the archive, the ARCHIVE button is enabled and can be tapped to select a text from the archive instead of entering a new one. Tapping ARCHIVE opens the archive dialog (see below). 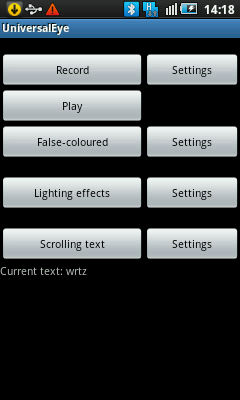 Tapping TEXT COLOUR calls the Color Setting dialog to choose the text colour. The current text colour is shown to the right of this button. 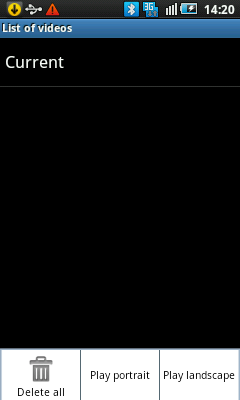 If there is apparently nothing to see, the current text colour is "black". 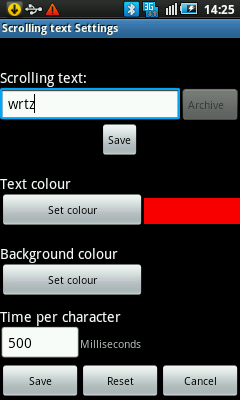 Tapping BACKGROUND COLOUR calls the Color Setting dialog to choose the background colour of the text. The current background colour is shown to the right of this button. 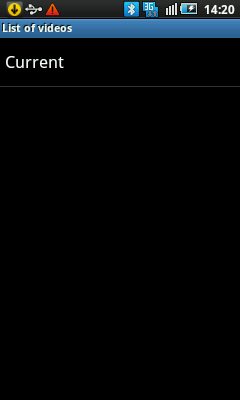 If there is apparently nothing to see, the current background colour is "black". 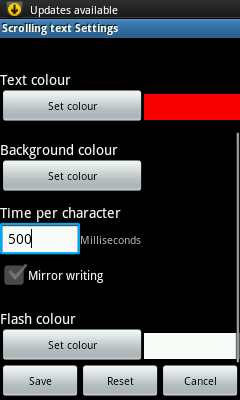 Enter the millisecondes in the TIME PER CHARACTER area for the speed of the scrolling text per character. Do not enter a time too small, to read the text. Check reading the text with the entered time! Scroll the display downward with your finger to see the remaining options. Check the MIRROR WRITING box to scroll the text in mirror writing to enable a man in front to read the text in his driving mirror. Tapping FLASH COLOUR calls the Color Setting dialog to choose the colour of the flash. The current flash colour is shown to the right of this button. 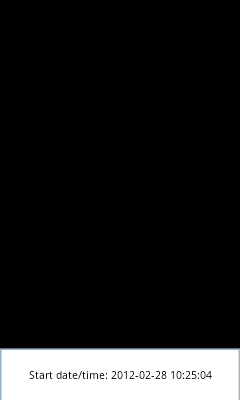 If there is apparently nothing to see, the current flash colour is "black", this way you can suppress the flash (provided that the background colour is also set to black, see above). The archive dialog lists all saved texts. 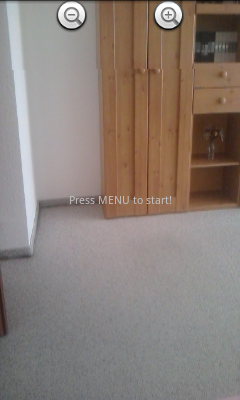 Tapping an entry in the list accepts the text for scrolling and closes the dialog. 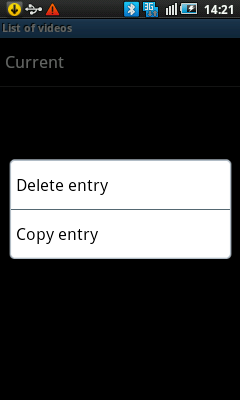 Tapping and holding an entry opens the context menu (as shown here) to delete the entry. This dialog allows to choose a colour. Each colour is composed of the 3 fundamental colours red, green and blue and each of these fundamental colours has a value between 0 and 255. If all 3 values are 0, the pixel is black, if all 3 are 255, the pixel is white. By setting the 3 fundamental colour values you can choose the corresponding real colour. Tapping the Plus or Minus button increases/decreases the corresponding value by 1, tapping and holding scrolls the value up/down. The values have to be between 0 and 255. The background colour of the dialog depicts the real colour, composed of the 3 current values. 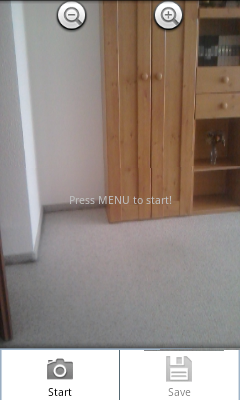 Tapping RECORD starts the camera in preview mode. In this mode nothing is recorded! Therefore a hint "Press MENU to start" is shown in the middle of the display (this hint may be poorly readible depending on the foreground). In preview mode a "+" and "-" button appears in the upper area of the display to zoom in and zoom out. Attention: Zooming is possible only in preview mode and only if camera is able to zoom and zooming is available only for Android Version 2.2 or higher. Pressing the MENU key of the smartphone calls the options menu. While recording was not yet started, the options are as shown here and you can start recording; when recording was started, you can now stop recording and the camera is in preview mode again with the hint "Press MENU to resume". Press MENU and resume recording with the option RESUME or save the recording permanently with the option SAVE. Recording will then be stored with date and time of the beginning of the recording. 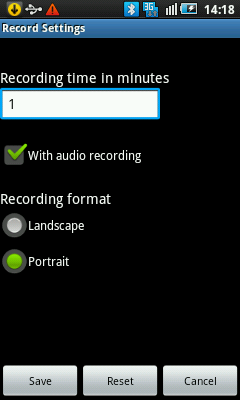 Attention: By tapping the option "Start" to start recording, the previous recording is removed. To avoid overwriting and to store a recording permanently, choose the option SAVE while preview mode is not yet finished. To leave and finish recording dialog press the BACK key of the smartphone, regardless of the status: preview mode, recording started or stopped. While the camera is on, the display timeout is set to off. Leaving the dialog resets the timeout to its previous value. Enter the recording time in minutes in the corresponding area. Entering e.g. 10 minutes records first 10 minutes in a file. The next 10 minutes are recorded in a second file. For all following 10 minute periods the oldest file of the existing files is removed and recording is stored in a new file. So, generally you have 2 files and the recorded past comprises at least 10 minutes and at most 20 minutes (if the second file is nearly finished). If you stop and resume recording the number of the files increases but the sum of the recorded past does not change. Check the box WITH AUDIO RECORDING to record with sound. You have to choose the orientation of the recording (portrait or landscape) depending on the orientation of the smartphone. Tapping PLAY displays the list with all stored recordings including the current recording. While nothing was recorded the list is empty. After the first recording the list contains at least the item "Current" with the current recording. When you have stored some recordings (see Record) or copied (see below), additional entries are available with date and time of the beginning of the recording. Tapping an entry of the list starts play back. By pressing the BACK key of the smartphone, the play back is terminated and the list is shown again. If recording is played back in wrong orientation, press MENU to choose the right orientation from the options menu. Choose the orientation for play back: portrait or landscape. The choise persists for all following play backs until changed again. Furthermore you can delete all entries of the list with their corresponding files (and release the storage space). Tapping and holding an entry of the list opens the context menu to delete the entry. If the selected entry is "Current", the context menu let you copy the recording to store it permanently, thus avoiding overwriting by the following recording. 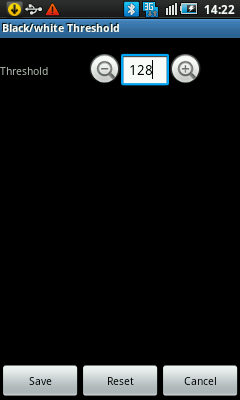 Pressing the MENU key of the smartphone while play back is running displays the date and time of the beginning of the record file currently being played. Tapping the option closes the option again. When play back is started or when you tap the display during play back, a tool bar at the bottom of the display is shown to manipulate the play back. In this tool bar the time of the present scene is shown. This time starts with 0 (start of the file) and ends with the record duration of the file (end of file). To evaluate the absolute time of the scene, press MENU to get the date and absolute time of the beginning of the record file and add the time of the tool bar. Tapping LIGHTING EFFECTS starts the lighting effect. The lighting effect runs until the BACK key of the smartphone is pressed. Thereafter you are in the main menu again. While the lighting effect executes, the display brightness is maximized and the display timeout is set to "off". 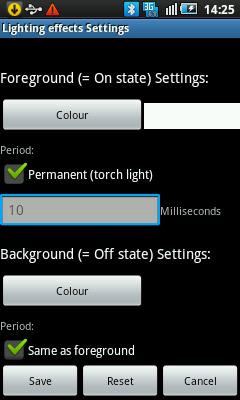 Leaving the lighting effect resets brightness and timeout to their previous values. Tapping COLOUR below "Foreground Settings" calls the Color Setting dialog to choose the flash colour (or torch colour, respectively). The current colour is shown to the right of this button. If there is apparently nothing to see, the current colour is "black". Check the box PERMANENT to turn the flash into a permanent light (torch). 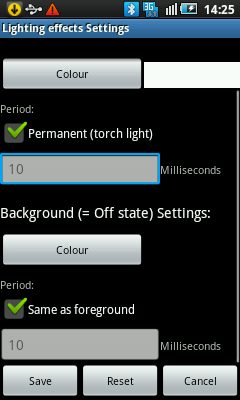 If this box is unchecked, you can enter below the duration of the flash in milliseconds. 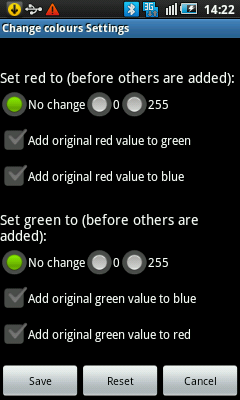 Tapping COLOUR below "Background Settings" calls the Color Setting dialog to choose the colour of the background between 2 flashes. The current colour is shown to the right of this button. If there is apparently nothing to see, the current colour is "black". Check the box SAME AS FOREGROUND to accept the flash duration for the period between two flashes. If the box SAME AS FOREGROUND is unchecked, scroll the display downwards with your finger to enter the time between two flashes in milliseconds. Tapping FALSE-COLOURED starts the camera and shows the live cam image false coloured on the display. The camera is on until the BACK key of the smartphone is pressed. Thereafter you are in the main menu again. For a short time after start 2 buttons "+" and "-" are shown in the upper area of the display to change the zoom of the camera. Attention: The zoom can be changed only if supported by the camera and if Android Version 2.2 or higher is installed on the smartphone. When no buttons are clicked for a time, the buttons disappear but can be invoked again by tapping and holding anywhere on the display. Choose the mode of the false-coloured representation. You have the choice to let the coloures unchanged (real colours), to change them to grey scale, to change them to black-white only (all pixels above a threshold are white and below are black), to change them individually (see below) or to filter out one colour and to set all others to black or white. Additionally, you can invert the colours for each mode. Define the threshold for the black-white-representation. All pixels above the threshold are white, all below the threshold are black. Tapping the Plus or Minus button increases/decreases the value by 1, tapping and holding scrolls the value up/down. The value must be between 0 and 255. If you want to change the colours individually you can define in this dialog, how. Each colour is composed of the 3 fundamental colours red, green and blue and each of these fundamental colours has a value between 0 and 255. If all 3 values are 0, the pixel is black, if all 3 are 255, the pixel is white. 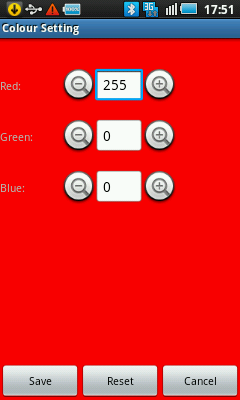 First you can define for each of the 3 fundamental colours, if it is to be unchanged, set to 0 or set to 255. Regardless of this first choice you can additionally define for each fundamental colour, if the fundamental colour of the original pixel from the camera is to be added to one of the other fundamental colours or to both. Take into consideration, that not all combinations are reasonable. E.g. if you decided to set green to 255 and you want to add the red value to green, then the result is without any effect, since the green value cannot exceed 255. To interchange e.g. red with green, set red to 0, set green to 0, add red to green and add green to red. To filter out a colour, define the colour to filter. Each colour is composed of the 3 fundamental colours red, green and blue and each of these fundamental colours has a value between 0 and 255. If all 3 values are 0, the pixel is black, if all 3 are 255, the pixel is white. 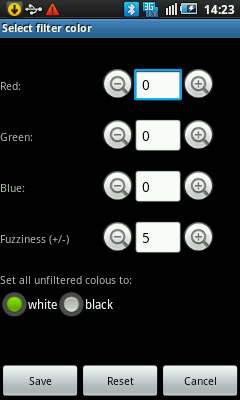 By setting the 3 fundamental colour values you can choose the corresponding filter colour. Tapping the Plus or Minus button increases/decreases the corresponding value by 1, tapping and holding scrolls the value up/down. The values have to be between 0 and 255. The background colour of the dialog depicts the colour, composed of the 3 current values. Since the colours do never match exactly the filter colour, you can define a fuzziness value for all of the 3 fundamental colours of the filter. This value must also be between 0 and 255 and its meaning is, that a colour passes the filter, if each of its fundamental colours is in the range of the corresponding filter colour plus/minus the fuzziness. Finally, you can define how to display all pixels retained by the filter (the background for the filter colour): black or white.